Connecting NT patterned assemblies & workers. 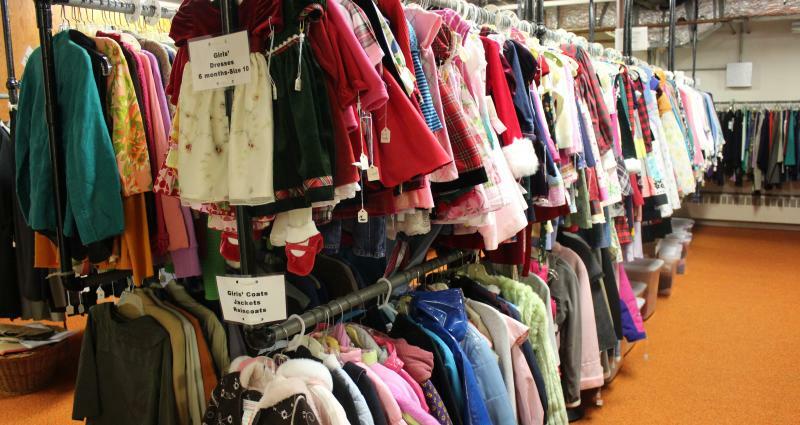 "For more than 60 years the CMML Clothing Center has provided new toiletries and new and gently used clothing and accessories, free of charge, to commended workers and missionaries. Clothing, as well as funds to purchase clothing and other necessary items, is donated from people throughout the United States. Organized and maintained by volunteer help, the Clothing Center continues to be a blessing to the Lord’s servants throughout the world." Both domestic/homeworkers (not just overseas workers) are welcome to visit the Clothing Center and take whatever clothing items, accessories, and toiletries that they might need for themselves and their families. We do not mail items to individuals so a visit is necessary. visitors can stop in during the Monday through Friday workweek during CMML office hours. Calling the office would ensure that someone is available to let the visitors in. It is always helpful if we know when someone is coming so that we can have someone from our volunteer staff, or myself, available to provide assistance. People often e-mail Marilyn Risden to set up a time to visit. Her email is: marisden AT optonline.net. The CMML website provides more in-depth information about the Clothing Center as well as office phone numbers. Germantown Christian Assembly, Philadelphia, PA. This month Assembly Care was at Germantown Christian Assembly in Philadelphia doing a presentation along with Stewards Foundation and Believers Stewardship Services. We all noticed that the building had an active leak from the peak of their roof; and it hadn’t rained for a few days. After asking we found out they’d been struggling with leaks for well over a year. Damage was evident inside on the ceiling; the roof needed to be replaced as well. We asked if we could help get the word out about their repair bill. They’ve been quoted approx $50k to repair their roof and the ceiling damage (very high up) on the inside. ACM has set up a donation page and is asking you to pray about helping with this practical need Germantown is facing. You can give by cellphone by texting GERMANTOWN to (650) 516-4501. You can give by credit card by clicking here. As we look at whats going on with natural disasters today and the devastation that is happening so widely. We continue to lift our brothers and sisters up before the Lord. We want them to to be strengthened with His strength as they face the devastation of their homes and communities and we want to encourage them as we're able. If you're looking for a way to help support Assemblies that have sustained damage in the path of Hurricane Harvey, Feel free to text "DISASTER" to our 2COR9 Number 650-516-4501 where it will lead you through giving via your phone. Also you can visit our hub HERE, follow the instructions then click on "assembly disaster relief" in the drop down menu in order to give online. Let us know if you have any questions. Christian Workers Fellowship Fund, Inc. was establishedin 1957 as a tax exempt corporation to help provide the needs of Assembly commended workers in the United States and Canada, as the Lord provides. 2017 marks 60 years of CWF service. The affairs of CWF are managed by a board of directors which serves without remuneration. All gifts of money that are received from donors for commended workers are disbursed to commended workers. Only gifts given specifically for the office operations are used for office operations. CWF does not take a percentage of worker funds to pay for office operations. All donors receive a tax deductible receipt as provided in section 170 of the Internal Revenue Code described in section 501 (c) (3). All workers who receive $600 or more through CWF, at the end of the year receive a 1099 tax form as dictated by the IRS. We would like to welcome Todd Ericson to the CWF board. Todd Ericson has replaced Rosa Lea Williams who retired from the CWF board of directors after 29 years of service. Last month I celebrated 3 years with Life’s Key. How quickly the time has gone! So much has happened in that time, but our goal to reach as many current and ex-offenders with the Gospel and truth contained in God’s Word remains the same. Please keep us in prayer as we continue to look for new avenues and opportunities. I will be attending the Pennsylvania chaplains conference in May, and hope to make some good connections and gain some additional help in promoting the ECS courses to those incarcerated in our home state. Please also keep me in prayer as I continue to look for new opportunities to share Life’s Key and the Course Sponsorship Program. I was in New York last month, and am so thankful that the Lord led people in two different churches to sponsor 5 more of our courses! The total is now up to 54 out of 82, which puts us almost two thirds of the way to having every course sponsored and every inmate being prayed for. God is good, and God is working! I will be travelling to New Jersey this month, and am thankful for the invitation to share what the Lord is doing with some fellow believers there. Below is one of the most wonderful letters I have received. It’s a great account of how someone can come across our courses, and how God can use that message and the work of our volunteers to change a life. It was a great encouragement to hear the difference it has made for him! “Thank you so much for the kind letter and your organization’s diligence to keep track of me through my journeys of incarceration and bible study! I appreciate the prayers and concern each one of your ministry members has for us every day. It is truly a blessing. I have a new location and expect to remain here for some time if not for the duration of my sentence. I want to share with you a bit about the effectiveness of your bible study to share with your staff. First of all, I started the courses from discovering one laying on a table with no owner. I picked it up and read through it. Reading just a few pages, I knew it was something I needed to grow in my personal relationship with Jesus, so I requested my first lessons. Secondly, I began the coursework and received not only the certificates, but the personalized responses to my test sheets. This was uplifting and motivating in a way I can barely express properly. Third, receiving new books with lessons became exciting and has built my personal relationship with Jesus in such a way that others around me began asking for your enrollment information. So it is with great sincerity and a humble heart that I say thank you to EVERYONE at Life’s Key and ECS Ministries for all your efforts and prayers. They truly make a difference in people’s lives, both in and out of jail or incarceration. We are well into the third quarter of school. We now have 69 students. The girls BB team is undefeated in league play. The boys just won their first game so we are all excited. The tournament is two weeks away. We missed two days because of muddy roads in January but not much moisture recently although it is raining some today. We still have not heard from the inspector from last year. We are not really complaining, but until she comes we have to be extra vigilant to be ready. Sounds somewhat like how Christians should be about the Lord’s return. Thanks to all who keep us in your prayers for a good outcome. We are in need of a different bus – pray God will lead us to just the right one. I am looking on Ebay at one that ends tomorrow. Also, we will need a first grade teacher for next year. Jen Mullen is filling in this year but really would rather teach art next year – her area of expertise. Pray God will send just the right person to fill that need. We need more housing at the mission. We are prayerfully starting two new building projects to meet that need. One is a remodel of a former classroom into a one bedroom apartment. The other is a large two story building that can be a guest house and team house as well as a residence. We have lots of people interested in helping the mission in very practical ways so we expect to see quick progress on these projects. Ruth has been sick with a bad cold (very persistent cough) for 5 days now. Please pray for her to regain strength and health. One of our Navajo elders passed away two weeks ago. His death was rather sudden although he was in his 80’s. The other Navajo elder is also in his 80’s and not in good health. Pray God will raise up young Navajo men to fill this void. We have several young men attending the chapel but they are also young believers. We already see some stepping up to take more responsibility. Continue to pray God will meet the needs of the school food program. We are no longer on the federal school lunch program. It costs about $175 per day – serving about 150 meals per day. Pray also God will continue to provide funds that allow us to hire some local Navajo believers for work at the mission – janitor, cook, librarian and teacher’s aide. This runs about $900 per week. God is faithful. Bus repairs is another major expense as we have to keep four buses running. The roads are very bumpy right now because of all the mud. We thank you for your prayers and support. We are enjoying God’s blessing and feel God is at work – especially with the changes in the church. Will be fun to see what He does. Several years ago Ann Bjorlie was burdened to start a discipleship program for young women. Her vision was to inspire and prepare them to serve God where He has placed them, with the gifts He has given them. Since 2010, Ann has welcomed many young women into her life and home, exposing them to the example and wisdom of godly women in all stages of life. The program runs for two weeks, beginning with ice-breaker games and a light supper on the first Sunday, and concluding with a debrief brunch on the final Saturday. The program is nonstop learning and hands on application of many spiritual and practical skills. The first week starts out with two long days learning how to study the Bible. Kathy Morell leads these sessions, alternating lectures with practice study sessions, emphasizing the online resource, eSword. Kathy’s session is then built upon by Bernadette Veenstra, as she teaches how to share what you’ve learned studying the Bible, by teaching children’s Bible clubs. Kathy Holiday teaches a session on the ministry and practice of hospitality and cooking for crowds. Days are spent cooking, and then hosting a community supper. Testimonies and life stories are shared, by older and younger, married and single women. A five day Bible club is led by the attendees. We pray together and sing together and laugh together. One young woman teaches how to share the gospel, using paint board techniques. An older woman shares her life story of being a missionary and also tips for visiting nursing homes. A variety of gifts and callings are modeled, skills are taught and practiced. Discipleship happens in the Bjorlie home, alongside the normal every day tasks of housekeeping, child rearing and cooking. Two weeks seems hardly enough time to impart all the info or to take it all in! Many young women have been through the program, and we are praying about the young women who will attend this year. We are praying for cleared schedules and prepared hearts. Discipleship and following the Lord always incur sacrifice. That is no less true when attending the In Tents Discipleship Program. But, following the Lord and discipleship is also very rewarding. No one will leave In Tents unchanged. Skills will be learned, life long friendships will be made. The dates for In Tents 2017 are Sunday, June 18 through Saturday, July 1. We are very excited about what God will do in our lives and in the lives of every woman involved. Please prayerfully consider joining us yourself or encouraging a young woman to attend. This is a faith ministry and our attitude has always been, “freely you have received, freely give.” We do accept gifts, but we do not charge the young women for their training. To ensure your spot in the program, apply early! In an effort to understand the current missions’ climate among U.S. assemblies, together with its challenges and opportunities, CMML is considering the following question: Is the view of missions changing among U.S. assemblies? Please help by taking this brief, 2-minute survey. Your feedback is very valuable! Click here to take the survey. Scott DeGroff and Andrew Hawkinson. This is our third year coming together to seek the Lord in prayer for revival. The central location meeting will be in the Kansas City area, and at satellite locations around the continent, and globally too. We implore you once again to consider joining us as we seek a breakthrough together. It is easy to become weary in well doing, but the stakes are too high to quit now. Revival is needed because our blessed Savior is not getting the full glory He is worthy of, both from His lukewarm bride and from the unsaved who need an awakening. Mankind was made for His pleasure and to give Him glory and both the believers and unbelievers are robbing Him of what He rightly deserves through our rebellion and sin! Have we seen any results so far? We can honestly say can we see “ a cloud the size of a man’s hand”, but we are looking for a torrential downpour from on High. There is much to be encouraged about, yet we are hungry for more! Those who have attended in the past have been greatly blessed by the week and some have begun satellite sites in their own areas. Please prayerfully consider joining us in 2017 for His glory! Please visit http://naweekofprayer.com/ to register for the Kansas location, to contact us regarding the possibility of hosting a satellite location in your own region, or with any other questions. In the will of the Lord, Camp Hope will be holding their annual Spring Teen Retreat March 3-5, 2017 with Jon Kever (TN) as the scheduled speaker. The Spring Teen Retreat is a unique time for teens to gather around the Word of God learning life applications and wisdom for living in the world for the glory of Jesus Christ. You can register at www.camphopega.org/registration to register online or to download a paper registration form. In the will of the Lord, Camp Hope will be hosting the 2nd Annual Couples Retreat March 10-11, 2017 with Alan Malchuk (NC) speaking on the topic “Marriage on the Rock – Jesus Christ”. If you are looking to get away as a couple, be encouraged and edified from the Word of God and enjoy fellowship with other couples, this weekend is for you. We will have ministry from the Word, couple’s activities as a group and time to relax at camp or visit the surrounding areas. For Saturday night dinner, we will all go into Dahlonega to enjoy a meal together as the retreat ends. Camp Hope, in the will of the Lord, will host the Father/Son Retreat April 21-23, 2017 with Rod Sharp (NC) ministering the Word. This weekend is an opportunity for fathers and their son(s) to spend the weekend together under the teaching of the Word that they may be encouraged to “Watch, stand fast in the faith, act you like men, be strong” (1 Corinthians 16:13) and to enjoy different activities together through the weekend. Families can sleep in a tent or in one of the camper cabins. Support us when you shop on Black Friday and Cyber Monday. #StartWithaSmile at smile.amazon.com/ch/74-3177436 and Amazon donates to Assembly Care Ministries Inc.